Dominic Scarborough has written an article for Catholic World Report Outside the Magic Circle which is subtitled "Tension builds between the Bishops' Conference of England and Wales and orthodox Catholics." He looks at the way in which the BCEW presents a common front on every issue, the ostracism of Bishop O'Donoghue, the Soho Masses, the designation of "Taliban Catholics", and the response to Summorum Pontificum. 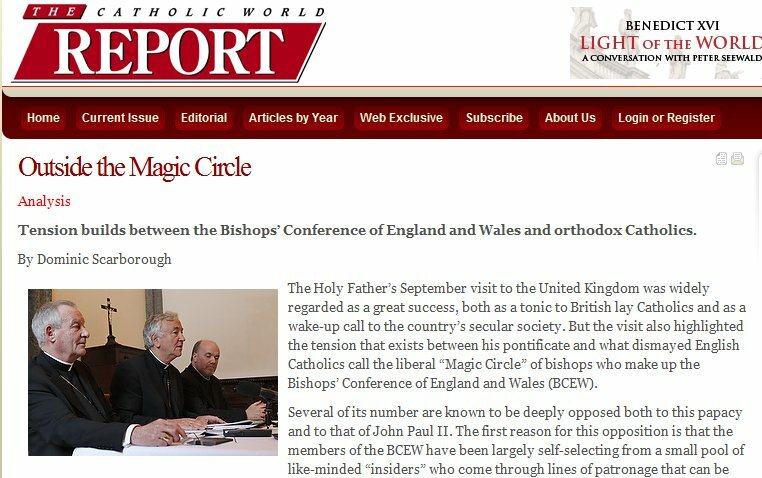 It is an interesting article in that we all know this stuff but having it set out clearly in Catholic World Report is a step forward.